Anabaena variabilis ATCC 29413 (=IUCC 1444 = PCC 7937) is a semi-thermophilic, filamentous, heterocyst-forming cyanobacterium. Heterocysts, which are specialized cells that form in a semi-regular pattern in the filament, are the sites of nitrogen fixation in cells grown in an oxic environment. A. variabilis ATCC 29413 was first isolated as a freshwater strain in 1964 in Mississippi by R.G. Tischer, who called the strain Anabaena flos-aquae A-37 . He was primarily interested in the extracellular polysaccharide produced by this strain [2–4], which was subsequently called Anabaena variabilis by Healey in 1973 . It was characterized in more detail by several labs in the 1960’s and 1970’s [6–8]. In particular, the early work by Wolk on this strain led to its becoming a model strain for cyanobacterial physiology, nitrogen fixation and heterocyst formation [9–13]. Here we present a summary classification and a set of features for A. variabilis ATCC 29413 together with the description of the complete genomic sequencing and annotation. The general characteristics of A. variabilis are summarized in Table 1 and its phylogeny is shown in Figure 1. Vegetative cells of A. variabilis are oblong, 3–5 µm in length, have a Gram-negative cell wall structure, are normally non-motile, and form long filaments. Under conditions of nitrogen deprivation, certain vegetative cells differentiate heterocysts, which are the sites of aerobic nitrogen fixation (reviewed in [19,28,29]). Heterocysts, which comprise 5–10% of the cells in a filament, are terminally differentiated cells that form in a semi-regular pattern in the filament (Figure 2). Vegetative cells of A. variabilis can also differentiate into akinetes, which are spore-like cells that survive environmental stress . Nitrogen stress may also induce the formation of motile filaments called hormogonia in A. variabilis . 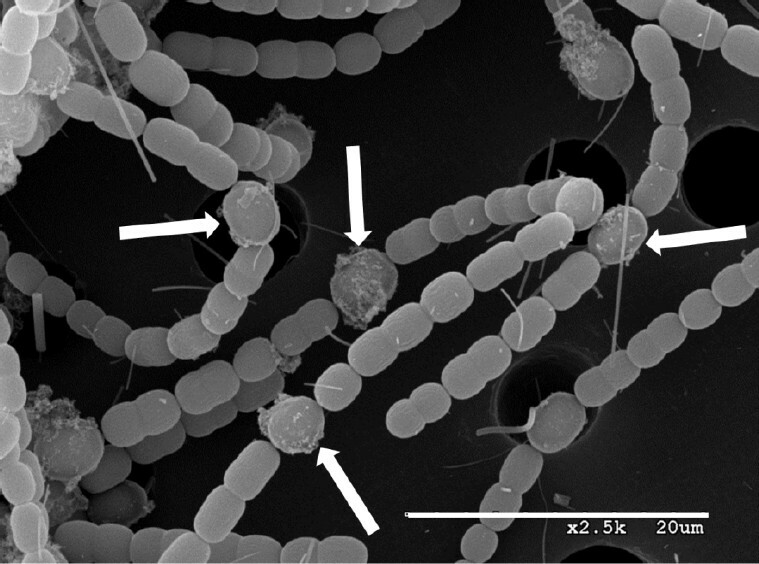 In other cyanobacteria hormogonia are required for the establishment of symbiotic associations with plants . A. variabilis has oxygen-evolving photosynthesis; however, it is also capable of photoheterotrophic growth and chemoheterotrophic growth in the dark using fructose [23,32–34]. The strain cannot ferment; hence, it does not grow anaerobically in the dark with fructose. 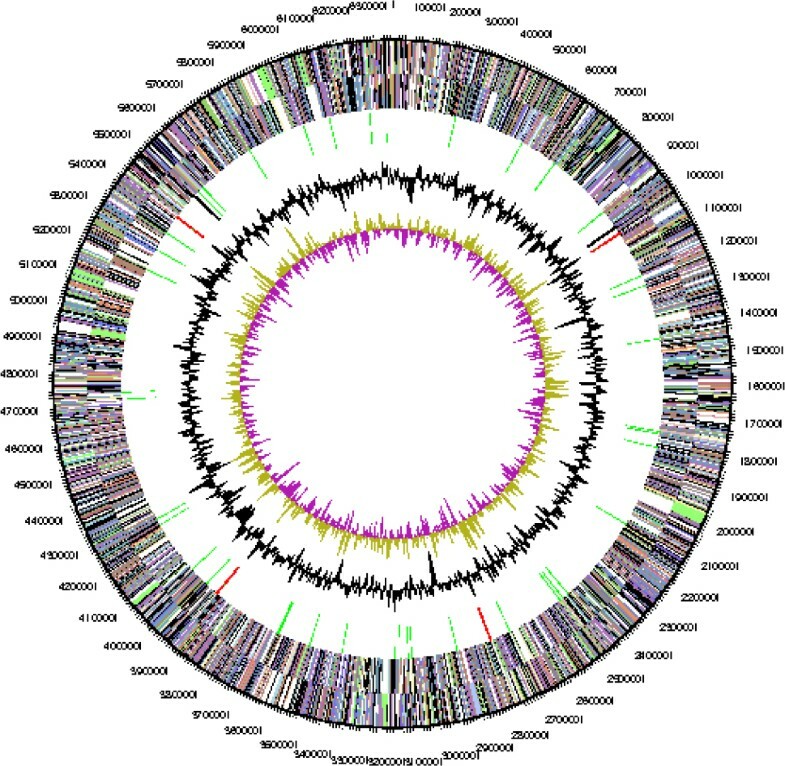 The genome sequence revealed the ABC-type fructose transport genes that were subsequently shown to be required for heterotrophic growth of the strain . Scanning electron micrograph of filaments of A. variabilis. Heterocysts are the larger cells with extracellular polysaccharide visible (indicated by the white arrows). Slender fibers are an artifact caused by the use of a glass fiber filter to support the cells on the membrane filter during washing. The length of the line is 20 µm. A. variabilis is a well-established model organism for heterocyst formation [35,36], nitrogen fixation [21,37,38], hydrogen production [39,40], photosynthesis [41–43], and heterotrophic cyanobacterial growth [9,32,44]. It is unique among the well-characterized cyanobacteria in that it has three sets of genes that encode distinct nitrogenases [19,37,38,45–48]. One is the conventional, heterocyst-specific Mo-nitrogenase, the second is another Mo-nitrogenase that functions only under anoxic conditions in vegetative cells and heterocysts, while the third is a V-nitrogenase that is also heterocyst specific. These nitrogenases are expressed under distinct physiological conditions so that only one nitrogenase is generally functional . The genome sequence has revealed a large 41-kb island of genes that all appear to be involved in synthesis and regulation of the V-nitrogenase, including the genes for the first vanadate transport system to be characterized in any bacterium . The V-nitrogenase of A. variabilis has been exploited for its ability to make large amounts of hydrogen as a potential source of alternative energy production [39,40]. An axenic culture of A. variabilis ATCC 29413 was grown photoautotrophically in one L of an eight-fold dilution of the medium of Allen and Arnon (AA/8) , supplemented 5.0 mM NaNO3 at 30°C with illumination at 50–80 µ Einsteins m−2 s−1 to an OD720 of about 0.3. Cells were harvested by centrifugation, frozen and then lysed by a combination of crushing the frozen pellet with a very cold mortar and pestle, and then treating the frozen powder with lysozyme (3.0 mg/ml)/proteinase K (1 mg/ml) in 10 mM Tris, 100 mM EDTA pH 8.0 buffer at 37°C for 30 min. This was followed by purification of the DNA using a Qiagen genomic DNA kit. The DNA was precipitated with isopropanol, spooled, and then dissolved in 10 mM Tris, 1.0 mM EDTA pH 8.0 buffer. The purity, quality and size of the bulk gDNA preparation were assessed by JGI according to DOE-JGI guidelines. Genes were identified using two gene modeling programs, Glimmer  and Critica  as part of the Oak Ridge National Laboratory genome annotation pipeline .The two sets of gene calls were combined using Critica as the preferred start call for genes with the same stop codon. Genes with less than 80 amino acids that were predicted by only one of the gene callers and had no Blast hit in the KEGG database at 1e−5 were deleted. This was followed by a round of manual curation to eliminate obvious overlaps. The predicted CDSs were translated and used to search the National Center for Biotechnology Information (NCBI) nonredundant database, UniProt, TIGRFam, Pfam, PRIAM, KEGG, COG, and InterPro databases. These data sources were combined to assert a product description for each predicted protein. Non-coding genes and miscellaneous features were predicted using tRNAscan-SE , TMHMM , and signal . The linear incision element is 37,151 bp long with a higher GC content (46%) than the rest of the genome (Figure 4). The incision element has 40 ORFs of which only 5 have any similarity to known genes. AvaD004 has about 40% aa similarity to many proteins provisionally identified as phage terminases, which are involved in phage assembly. AvaD0022 is similar to RNA polymerase sigma factors, with 35% identity to a sigF encoded sigma factor, present in many other cyanobacteria including two copies of a similar gene of the large chromosome of A. variabilis. 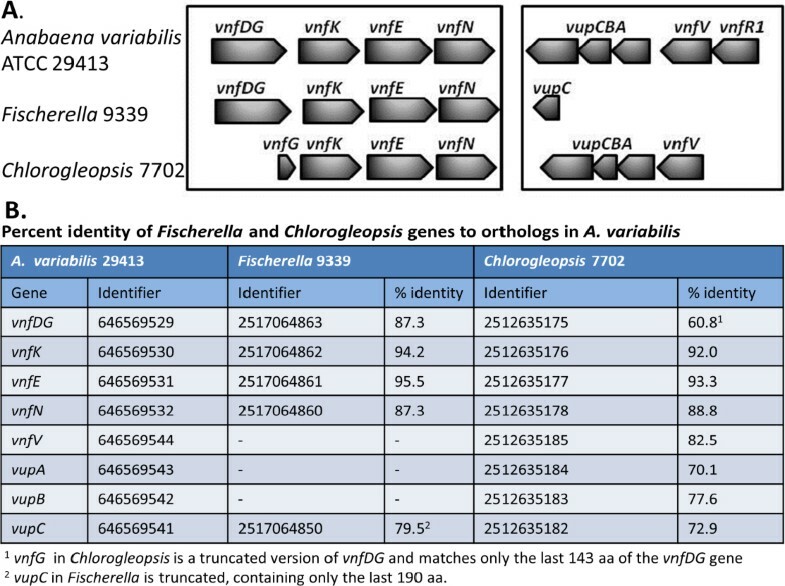 AvaD0026, identified as similar to site specific XerD-like recombinases shows 50–55% identity to genes present in many cyanobacteria including the B plasmid of A. variabilis and the alpha plasmid of Anabaena sp. PCC 7120. 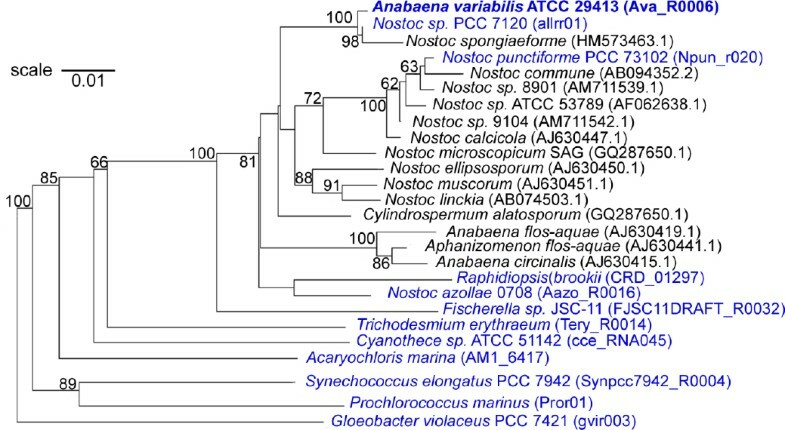 AvaD0037 shows similarity to the XRE family of transcriptional regulator and 65% identity to similar proteins in three sequenced strains of the cyanobacterium Cyanothece. AvaD0015 is a histone-like DNA binding protein with about 70% identity to the HU gene present in most cyanobacteria including the gene on the large circular chromosome of A. variabilis. Many linear molecules overcome the problem of replicating the genome ends using terminal hairpins; however, there is no evidence of such repeats in this element.